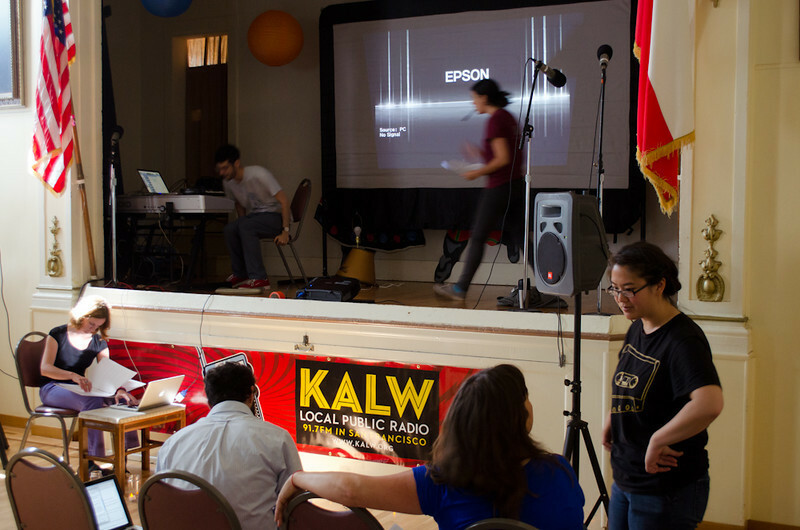 Hear Here KALW June 2012 MAPP Event, 2 June 2012, at the Polish Club, San Francisco, California. Read more about the event at blog.meldedbits.org. Words and images copyright 2012 Rob D. Guettler. Contact "rgweb 'at' meldedbits.org" (replace 'at' with @) for commercial use requests. This work by Rob D. Guettler is licensed under a Creative Commons Attribution-Noncommercial-Share Alike 3.0 United States License. Event preparations. Seth Samuel and Molly Samuel on stage; Erica Mu, right; Wendy Baker, computer. KALW Mission Arts and Performance Project (MAPP) June 2012, The Polish Club, 3040-22nd St. at Shotwell St., Mission district, San Francisco, California.